Heartworm disease or dirofilariasis is a serious and potentially fatal disease. It is caused by a blood-borne parasite known as Dirofilaria immitis. 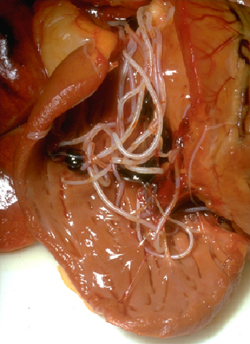 Adult heartworms are found in the heart and adjacent large blood vessels of infected dogs. Rarely, worms may be found in other parts of the circulatory system. The female worm is 6 to 14 inches long (15 to 36 cm) and 1/8 inch wide (5 mm). The male is about half the size of the female. One dog may have as many as 300 worms present when diagnosed. "Adult heartworms may live up to five years..."
Adult heartworms may live up to five years and, during this time, the female produces millions of offspring called microfilaria. These microfilariae live mainly in the small vessels of the bloodstream. What is the life cycle of the heartworm? 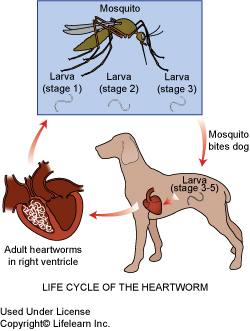 "...the parasite requires the mosquito as an intermediate host..."
The life cycle of the heartworm is complicated; the parasite requires the mosquito as an intermediate host before it can complete its life cycle in the dog. As many as 30 species of mosquitoes can transmit heartworms. The life cycle begins when a female mosquito bites an infected dog and ingests the microfilariae during a blood meal. The microfilariae develop further for 10 to 30 days in the mosquito's gut and then enter its mouthparts. At this stage, they are infective larvae and can complete their maturation when they enter a dog. The infective larvae enter the dog's body when the mosquito bites the dog. They migrate into the blood stream and move to the heart and adjacent blood vessels, maturing to adults, mating and reproducing microfilariae within 6-7 months. "Canine heartworm disease occurs all over the world." "...the disease is not spread directly from dog to dog." Since transmission requires the mosquito as an intermediate host, the disease is not spread directly from dog to dog. Spread of the disease therefore coincides with mosquito season, which can last year-round in many parts of the United States. The number of dogs infected and the length of the mosquito season are directly correlated with the incidence of heartworm disease in any given area. The mosquito usually bites the dog where the hair coat is thinnest. However, having long hair certainly does not prevent a dog from getting heartworms. It usually takes several years before dogs show clinical signs of infection. Consequently, the disease is diagnosed mainly in two to eight year old dogs. The disease is rare in dogs less than one year of age because the microfilariae take five to seven months to mature into adult heartworms after infection. Unfortunately, by the time clinical signs are seen, the disease is usually well advanced. 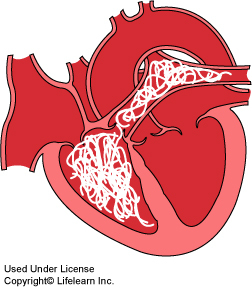 Adult heartworms: Adult heartworms cause disease by clogging the heart and major blood vessels leading from the heart. They also interfere with the valve action in the heart. By clogging the main blood vessel, the blood supply to other organs of the body is reduced, particularly blood flow to the lungs, liver and kidneys, leading to malfunction of these organs. The signs of heartworm disease depend on the number of adult worms present, the location of the worms, the length of time the worms have been in the dog and the degree of damage that has been sustained by the heart, lungs, liver, and kidneys. "Signs of heartworm disease are a soft, dry cough, shortness of breath... and loss of stamina." The most obvious clinical signs of heartworm disease are a soft, dry cough, shortness of breath, weakness, nervousness, listlessness, and loss of stamina. All of these signs are most noticeable following exercise, when some dogs may even faint or become disoriented. Your veterinarian may notice abnormal lung and heart sounds when listening to the chest with a stethoscope. In advanced cases, congestive heart failure may be apparent and the abdomen and legs will swell from fluid accumulation. There may also be evidence of weight loss, poor condition, and anemia. Severely infected dogs may die suddenly during exercise or excitement. Microfilariae (immature heartworms): Microfilariae circulate throughout the body but remain primarily in the small blood vessels. Because they are about as wide as the small vessels, they may block blood flow in these vessels. The cells being supplied by these vessels are then deprived of the nutrients and oxygen normally supplied by the blood. Microfilariae primarily injure the lungs and liver. Destruction of lung tissue leads to coughing. Liver injury leads to cirrhosis of the liver, causing jaundice, anemia, and generalized weakness. The kidneys may also be affected and allow toxins to accumulate in the body. Serological test for antigens to adult heartworms (antigen test, ELISA or SNAP test): This is a test performed on a blood sample. "The most widely used test detects antigens (proteins) produced by adult heartworms." It is the most widely used test because it detects antigens (proteins) produced by adult heartworms. It will be positive even if the dog does not have any microfilariae in the bloodstream (approximately 20% of cases). Dogs with less than four or five adult heartworms may not have produced enough circulating antigen to produce a positive test result, so there may be an occasional false negative result in dogs with a low burden of parasites, or in the early stages of infection. Because the detected antigen is only produced by the female heartworm, a population of only male heartworms will also give a false negative. Therefore, there must be at least four to five female worms for a positive result by this test. "Blood sample examined under the microscope for the presence of microfilariae." A blood sample is centrifuged and then examined under the microscope for the presence of microfilariae. If microfilariae are seen, the test is positive. The number of microfilariae seen gives us a general indication of the severity of the infection. However, the microfilariae will be found in the bloodstream in greater numbers in the summer months and in the evening, so sampling time can affect this test. Approximately 20% of dogs do not test positive even though they have heartworms because their immune system has acquired the ability to destroy the microfilariae. Also, there is another blood parasite that is fairly common in dogs that can be hard to distinguish from heartworm microfilariae. For these reasons, the antigen test is preferred for diagnosis. Other blood tests (CBC, blood chemistries, electrolytes): Abnormalities on the complete blood count (CBC) and blood tests for kidney and liver function may suggest the presence of heartworm disease. These tests will be performed on dogs diagnosed as heartworm-infected to determine the function of the dog's organs and health status prior to treatment. Radiographs (X-rays): A radiograph of a dog with heartworms will usually show heart enlargement and swelling of the large artery (pulmonary artery) leading to the lungs from the heart. These signs are considered presumptive evidence of heartworm disease. Radiographs may also reveal the condition of the heart, lungs, and pulmonary vessels. This information allows us to predict an increased possibility of complications related to treatment. Electrocardiogram (EKG or ECG): An electrocardiogram is a tracing of the electric currents generated by the heart. It is most useful to determine the presence of abnormal heart rhythms. This test can also detect enlargements in heart chamber size and help determine if a dog can safely undergo heartworm disease treatment. Echocardiography (ultrasound of the heart): An ultrasonic examination that allows us to see into the heart chambers to evaluate the general status of the heart, and even to visualize the heartworms. There is some risk involved in treating dogs with heartworms, although fatalities are now rare. "In the past, the drug used to treat heartworms contained high levels of arsenic..."
In the past, the drug used to treat heartworms contained high levels of arsenic and toxic side effects occurred more frequently. A new drug is available that does not have as many side effects, allowing successful treatment of more than 95% of dogs with heartworms. When some dogs are diagnosed, they have advanced heartworm disease. This means that the heartworms have been present long enough to cause substantial damage to the heart, lungs, blood vessels, kidneys, and liver. A few of these cases will be so advanced that it will be safer to treat the organ damage rather than risk treatment to kill the heartworms. Dogs in this condition are not likely to live more than a few weeks or months. Your veterinarian will advise you on the best treatment approach for dogs diagnosed with advanced heartworm disease. "Injectable drug to kill adult heartworms is given." An injectable drug to kill adult heartworms is given. It kills the adult heartworms in the heart and adjacent vessels. These injections may be divided and given thirty days apart. Your veterinarian will determine the specific injection schedule according to your dog's condition. Many dogs will also be treated with an antibiotic to combat potential infection with bacteria (Wolbachia) that inhabit the heartworm. "Complete rest is essential after treatment." Complete rest is essential after treatment. The adult worms die in a few days and start to decompose. As they break up, they are carried to the lungs, where they lodge in the small blood vessels and are eventually reabsorbed by the body. This resorption can take several weeks to months and most post-treatment complications are caused by these fragments of dead heartworms. This can be a dangerous period so it is absolutely essential that the dog be kept as quiet as possible and not allowed to exercise for one month following treatment. The first week after the injections is critical because this is when the worms are dying. A cough is noticeable for seven to eight weeks after treatment in many heavily infected dogs. If the cough is severe, notify your veterinarian for treatment options. Prompt treatment is essential if the dog has a significant reaction in the weeks following the initial treatment, although such reactions are rare. If a dog shows loss of appetite, shortness of breath, severe coughing, coughing up blood, fever, or depression, you should notify us. Treatment with anti-inflammatories, antibiotics, cage rest, and supportive care and intravenous fluids is usually effective in these cases. Treatment to kill microfilaria: Approximately one month following treatment to kill the adults, the dog is returned to the hospital for administration of a drug to kill the baby heartworms or microfilariae. Your dog may need to stay in the hospital for the day. Your dog is started on heartworm preventive after this treatment. "Newer heartworm treatment protocols use a variety of drugs to kill the microfilariae." Newer heartworm treatment protocols use a variety of drugs to kill the microfilariae. Your veterinarian will select the correct drug and administration time based on your pet's condition. Are any other treatments necessary? Dogs with severe heartworm disease may require antibiotics, pain relief medications, special diets, diuretics to remove fluid accumulations in the lungs, and drugs to improve heart function prior to treatment for the heartworms. Even after the heartworms have been killed, these dogs may require lifetime treatment for heart failure. This includes the use of diuretics, heart medications such as ACE-inhibitors, beta-blockers or cardioglycosides, and special low salt diets. What is the response to treatment and prognosis? Dog owners are usually pleasantly surprised at the improvement in their dog following treatment for heartworms, especially if the dog had been demonstrating any clinical signs of heartworm disease. Many dogs display renewed vigor and vitality, improved appetite, and weight gain. You can prevent your dog from getting heartworms by using a heartworm preventative. When a dog has been successfully treated for heartworms, it is essential to begin a heartworm prevention program to prevent future recurrence. With the safe and affordable heartworm preventives available today, no pet should ever have to endure this dreaded disease.